Crouse-Hinds Arktite® 4-Pole 3-Wire APJ Polarized circuit breaking plug accommodates 0.875 - 1.7-Inch conductor. 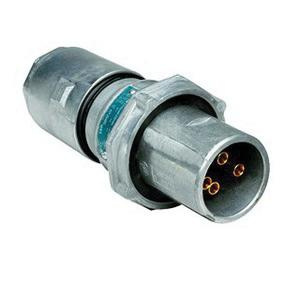 Grounding plug has copper-free aluminum construction. Plug has current rating of 100-Amps and voltage rating of 600-Volt AC/250-Volt DC. It measures 3-3/4-Inch Dia x 10-1/8-Inch. This plug has NEMA 4 configuration. It is suitable for use with compressor, conveyor and motor generator set. Circuit breaking plug is UL listed and CSA certified.